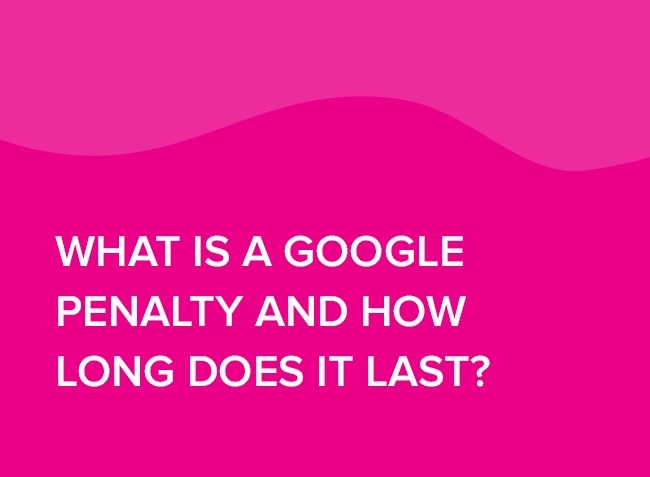 What is a Google Penalty and How Long Does it Last? A Google Penalty is when your website has been penalised by Google for inorganic or unnatural activity such as over optimisation of keywords, spammy back linking activity, thin website content or dodgy SEO practices. Basically, you website can be ranking one day right up there on page 1 and the next day it’s completely gone. We see it happen all the time and it’s complete hell for all business owners that rely on Google for generating their new business leads. and the worst part is that it’s not their fault. The blame lays with the search engine optimisation or SEO company that got them into this predicament. The poor business owners won’t know what hit them, perhaps even after a few weeks, when they notice a massive drop in business. There is however some hope when it comes to getting out of a Google penalty and most penalties can be reversed if action is taken. If you Google your business name and it’s suddenly not there then your website has been penalised. Simple as that and all I can say is that I feel your pain. Especially if you had nothing to do with it. So, what do I mean by this? Well, in many cases where a Google penalty has been imposed, this is generally due ( as stated above ), by the work or SEO techniques that you entrusted your SEO agency with. Most people we come across who are under a Google penalty, are basically clueless when it comes to SEO and have put all their trust, faith and hope that their SEO team will do the right thing. Let me take a step backwards here. Before businesses actually give their work to the SEO company, they do the ring around and unfortunately go with he company that offers the best deal in terms of pricing and ranking guarantees. This is the BIGGEST mistake you can make when it comes to your SEO and is the catalyst for the Google penalty. They sign up thinking they have done the right thing, but because the SEO company is on such thin budgets and margins they basically end up doing nothing. PLUS they generally don’t know what they are doing and have no idea about how Google works. Hence, you suffer a penalty Essentially, and I hate to say this but it’s your FAULT for thinking you could pay next to nothing and rank on Google. Im sorry that I say this but the buck stops with you; the decision maker and boy o boy did you stuff up here! Google Penalties can take a long time to get out of or have them reversed so it’s really important that you know what is going on and how you are going to get out of this. I am going to give you as much information as I can here but if you are still confused and want to speak to someone I am more than happy to chat with you anytime. Login to your web master tools account in Google. If you do not know what it is, just Google’ web master tools’ and use your Google gmail logins and that will get you into this. From hit the message button and see if there are any messages from Google. If there is a message saying that ‘ that Google has detected unnatural link building’ or something to that effect then you are the lucky ones. Although, you are unlucky in respect that your website has tanked, the lucky component is that Google has contacted you and you are now ready to address these issues in a positive way. Get cracking on this slowly and make sure that you do NOT do this yourself. If you want to reverse the manual action you need professional advice and help. having a DIY approach to this for the inexperienced, simply wont work and you may make matters worse. Remember, you have woken the Google gods ( the spam team) and they are watching you. The best thing moving forward, is not to piss them off even further. Do it properly or don’t do it at all. You will have to ditch your web URL and start all over again. Believe it or not a manual action has been imposed by a human. yes! An actual person has physically gone to your website from Google and they have deemed that your site does violate their guidelines when it comes to search. They can tell immediately that your website has have SEO work done to it; either ‘ on page’ or ‘off page’ and it does not comply with their ranking guidelines. So they are going to take your website and put it aside and not show it in the search results until you fix each and every issue. An I mean FIX THEM THOROUGHLY. If you think that a couple of fixes here and there are going to cut it – then think again – you are going to be in this for the long haul ( and this can take up to a year in some extreme cases) before you are released. So buckle up and get ready for the ride of your life that you will never want to go through again! On the other hand if your penalty is the result of a few back links then getting rid of these quickly will get you out of the penalty box. Anyway going back to Penguin the way out of this is to try to delete each and every bad back link then let Google know about your best intentions through their disavow tool. The worst part is that yo have to wait until Google’s next algorithmic update before you can tell if you have been successful. What a hassle and a complete nightmare. I absolutely hate this as it’s purely a waiting game. Meanwhile your business is in dire need of sales and you are not getting them cause your site has tanked. Google has made this process completely automated so there is no way to deal with this via Googles’ request for reconsideration. Hence all you have is 1 disavow tool. Again a real nightmare and unfortunately, you only have yourself to blame as you did choose the wrong SEO company! The best of the worst is a manual action rather than a Penguin penalty for your unnatural links. At least you can go about removing and pruning as many toxic links as you can and keep on filing requests to be allowed reinclusion. Essentially, you have more control over the situation as you can contact the Google spam team – cause you received the message in your WMT. Penalties for spammy links are extremely common. In fact, more common than you would have thought. The process to remove the penalty is quite simple; get the links removed and let Google know about this. However, like with anything there is a catch. That is; it can be incredibly difficult to get rid of these links especially if they were done on your behalf by and SEO firm. It’s a horrific process and speaking from experience, having successfully helped businesses in the past get out of a penalty, this takes and enormous amount of time and effort. Image trying to undo 2 or even 3 years of linking work. There could be thousands of these all over the internet, all owned by different people who can be extremely difficult to reach. What is the Panda Penalty? This was a great move by Google in it’s attempt to clean up websites that were basically thin on content. You know those sites that had a couple of paragraphs on each page and really didn’t light up the sky with anything important. Some sites were even built with content that kept on repeating main core keywords in the hope to accelerate rankings. Im sure you have seen these websites with really nasty content that basically told you nothing about what they did or what they offered. Anyway, the Panda update got rid of these websites and replaced them with well worded sites that communicated genuine, legitimate content. Panda also went about by penalising those sites for plagiarism. Any form of copying was dealt with harshly by the Panda beast. Think you can copy content from a competitor and get away with it…think again. So there you have the penalties: Penguin, Panda and a manual action. In any case the way to deal with all of these is to become search compliant. You cannot tip toe around this! You must be 100% compliant in the eyes of Google or you are going to get hit by a penalty. There are so many areas regarding compliance that it’s best left to the professionals. This is why I really stress to potential clients that call me up of the dangers lurking out there for any ‘monkey business’ or any non compliant activity. It only takes one foolish move and you are going to get busted. Related article: Is quality content good for SEO rankings? It will be impossible to recover from your penalty if you do not know what the root cause is. I can bet almost anything that the cause is from way too much link building by SEO agencies that are absolutely clueless when it comes to link activity. All they have done is build links randomly without and strategy or game plan – hence the penalty. Go back to them and see if they can help you determine the issues that are hindering your SEO campaign. My guess is they will be very unhelpful cause these SEO companies are strictly out for themselves and no one else and this is why you are in this predicament. Move on and this time pay the right and fair price for SEO and let them help you get out of the penalty. Unfortunately, for many people who are reading this blog, the horse has bolted so to speak. They are here cause they probably Googled ‘ google penalty’ or something similar as they have already been penalised or have noticed that there is an issue with their rankings. This blog is intended to help these businesses BUT it probably won’t help those people that are about to embark on an SEO campaign. These people will probably make the same mistakes that are very common when choosing a SEO supplier. That is, all based on cost and crappy guarantees. These business owners WILL unfortunately have to go through the process of copping a penalty before they find out about this blog. I want to add here that a hell of a lot of people don’t even realise that there is such a thing as a Google penalty. Realistically, why should they? It’s not their business to know about these things and this is where so many issues begin. Being naive and uninformed is a real issue and I personally do not see it improving. Cheap SEO options that promise immediate rankings are just far too tempting to refuse. Oh, well it’s a matter of live and learn for most people. People get jealous of your success online. Simple as that. Google has no way of determining the reason why you are getting links. All they are concerned about is the nature of these links. Cue, negative SEO. Malicious intent by competition to destroy your rankings through harmful back linking is now common practice and a factor that could trigger Google to impose manual actions or penalties. Anyone who knows a little bit about SEO can start a campaign of destruction against a competitor. I have witnessed companies rankings severely hampered due to this kind of attacks. This leaves you vulnerable and open to all sorts of aggression from rivals. The best prevention is being alert and on the look out for this type of increase or spikes in link activity. Keep an eye on your analytics as this will have all the data you need to gauge what’s happening. Be vigilant and always checking your web master tools account or analytics for unknown, foreign, or unaccountable links. Make a list of these and then use your disavow tool ( through Google) to let them know that these URL’s are not to be considered as part of your profile. WARNING: you have to do this before Google imposes their penalty on your site for these links. Quick action will result in you keeping your rankings. It’s a pain I know, but you have to be always on the look out for ruthless people trying to harm your business. It’s plain bad luck if this happens to you if you are trying to do the right thing in regards to SEO. But this is the internet landscape and Im afraid in some cases it’s not very pretty. Let’s be honest here, all businesses rely on Google to a certain extent, some more than others. This is why businesses need to remain current and up to speed with the latest changes implemented by Google. If, as a business owner you are too busy or simply are uninterested in this sort of thing THEN YOU MUST BE WORKING WITH AN SEO AGENCY that can do this on your behalf. I know this is hard to find but all I can say is give us a call here at SEO Sydney Experts on 02 9360 8514 and we will be able to help you not only get out of any penalties and restore your rankings. Next Next: Why You’re Websites Not # 1 on Google.